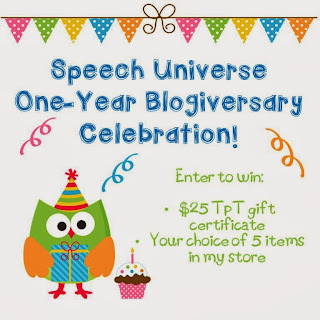 I can't believe that it has been one year since I started my little speech blog! I have learned so much over the past year. Through blogging, I have become more creative and thoughtful with working with my students. It really has renewed my enthusiasm for therapy! I have also learned so much more about technology and creating new activities than I ever thought possible. I have met so many awesome SLP's this year, and their ideas, energy, and wisdom amaze me! All in all, this year has been AMAZING! As a thank you to everyone who has supported me over this last year, I decided to do a little celebration. 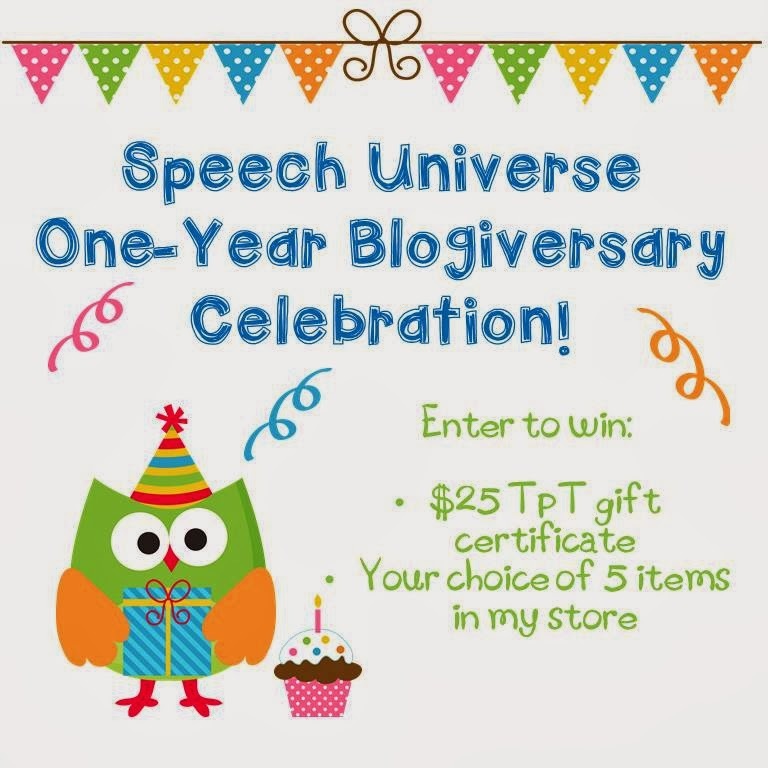 I am giving away a $25 TpT gift certificate and the winner's choice of 5 items from my store. You can enter to win this giveaway in the rafflecopter below. You can check out my store on TpT HERE to see what you could win! Congratulations! I just love your blog and your TPT store! I have used so many of your ideas! Thankyou! Wow! So generous!!!! Thank you Jen! Happy Bloggy Birthday! :) I'm be sure to share your giveaway on my page right now! Thank you! Happy Bloggy Birthday to you too! Thank you for this contest, hope I win--I have several of your items on my wish list to add to my collection! You are welcome! Thank you for all of your support this year! I agree! I started my blog in November too! Congrats! Your blog/products are amazing! Thank you so much for such an awesome compliment!